Florida Chief Financial Officer (CFO) and State Fire Marshal Jimmy Patronis will address the Florida House Government Operations & Technology Appropriations Subcommittee TODAY at 1:30 p.m. EST. 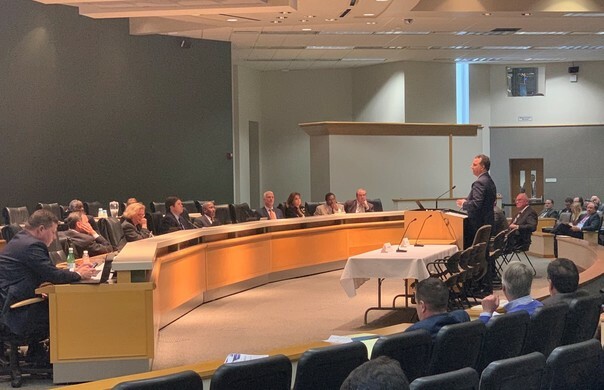 Florida Chief Financial Officer (CFO) and State Fire Marshal Jimmy Patronis spoke at the Florida Senate Banking and Insurance Committee this afternoon to address Assignment of Benefits abuse. Chief Financial Officer (CFO) Jimmy Patronis sent a letter to Triumph Gulf Coast, Inc., prior to their board meeting this afternoon regarding Hurricane Michael recovery efforts in the Florida Panhandle. Florida Chief Financial Officer (CFO) and State Fire Marshal Jimmy Patronis has been on the ground in the Panhandle affected counties since Hurricane Michael made landfall. He has been in constant communication with emergency management, local, state, and federal officials to assist with anything they may need. CFO Patronis is focused now on stopping post-storm fraud and urges Floridians to call his Insurance Help Line at 1-877-MY-FL-CFO to report anything suspicious.